SUMMARY: On The Day, alien invaders killed Dol's parents, along with one billion other humans across the globe. That was sixteen years ago, when Dol was just an infant. Since then, Dol and her best friend Ro have been raised in the Grasslands, hidden and protected by a mission Padre. But on Dol's seventeenth birthday, the aliens finally find and capture Dol and Ro. They are taken to the Embassy, part of the city formerly known as Los Angeles, to meet the alien Ambassador who wants to study and use Ro and Dol for her own purposes. There, they meet two others like themselves, Icon children with the supernatural ability to sense and control others' emotions. 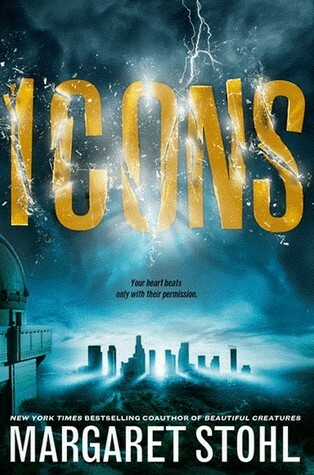 REVIEW: When I first started reading Icons, I thought it was going to be a five-star book. Crazy-creative world-building is easy to spot, and Icons has unique world-building in spades. I liked Dol and loved Ro, and I enjoyed trying to figure out just exactly what was going on. Ramona Jamona the pig just cracked me up, and I was actually a little sad when the aliens killed her. I love the "Classified" documents that appear between the chapters, especially since they helped to explain some things (while also introducing some new mysteries). But once Ro and Dol make it to the Embassy, the story started to lose its spark. Even more than 250 pages in, I still felt like I was trying to put together the pieces, trying to figure out just what was going on. I liked the puzzle of it, but it went on a little long for me. Plenty of questions, but almost no answers. I am still unsure exactly the point of the whole thing. Why did the Ambassador want the Icon children again? Huh? I feel like I must have missed something important, but I didn't care enough to go back to figure out what. All this stuff happened, but it felt so random and disconnected that I felt lost. While I liked Dol in the beginning, I got annoyed with her quickly. I get that she is sadness and sorrow, personified, but I didn't care for her behavior with Lucas (who I also didn't really care for). I loved Ro all the way through and just felt this tug at my heart that Dol was ultimately going to end up breaking his heart. That for sure didn't do Dol (or Lucas) any favors. THE BOTTOM LINE: In the end, I feel kind of sad about this book. I LOVED the first 100 pages, but I just felt so confused as to the how and why of it all. Why are the aliens here? Why did they kill a billion people? What do they want to do now, and why do they need to do that? Did I miss something? Surely, I must have. STATUS IN MY LIBRARY: We don't have it. I plan to give my ARC to a couple of my really smart readers to see what they think. If they like it, I'll get it for the library. Appeal to teens: I have no idea--I want to circulate this one a little with my better readers to get opinions.